Try it for yourself and if it does not meet your expectations then we are happy to exchange or refund. SAVE money with this fantastic offer while stock is available! We are based in the United States and all items will be shipped directly from United States. Ankle Weights are great for adding weighted resistance to your fitness and rehabilitation programs. The traditional styled ankle weights are made of heavy-duty nylon canvas, granulated steel shot packs for added comfort. You can target your lower body muscle groups, including inner and outer thighs, and get results as your muscles exert effort to lift and balance the weight of these ankle weights. Ankle weights are one of the best ways in which to add resistance to your lower body training, by targeting certain muscle groups. The leg and hip joint are like a lever and fulcrum. With the hip being the fulcrum, the farther away the weight, the harder it is to lift and balance. The same can be said for the knee joint. By adding a minimum amount of weight, the leg muscles must exert considerable effort to lift and balance the weights, which provides maximum results. •This 14-pound set includes two colored sand filled ankle weights that weigh 7 pounds each. 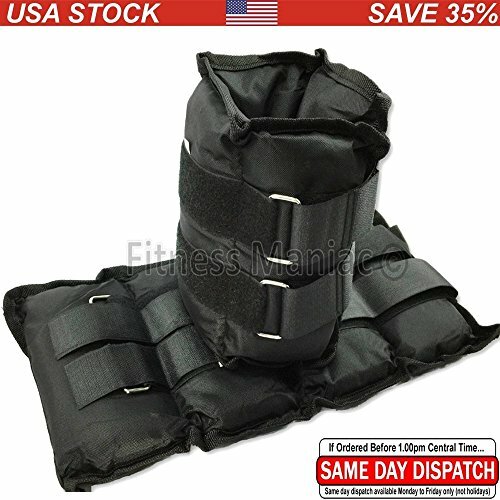 •Secure, velcro straps secure weights to ankle. •Perfect for weight training and rehabilitation. •PLEASE NOTE: the strap is adjustable and not the weights. Our price for this item is very competitive. These ankle weights are quite weighty. We suggest to wear socks under them to reduce the possibility of slippage during exercise. Comes in pair. This 14-pound set includes two ankle weights that weigh 7 pounds each. One size fits all. Secure, velcro straps secure weights to ankle. Perfect for weight training and rehabilitation. PLEASE NOTE: the strap is adjustable and not the weights. Our price for this item is very competitive. These ankle weights are quite weighty. We suggest to wear socks under them to reduce the possibility of slippage during exercise. "SAME DAY DISPATCH" if your order is placed by 1pm Central Time Monday to Friday! "FREE SHIPPING" on every order from Continental US! If you have any questions about this product by TFMUSA, contact us by completing and submitting the form below. If you are looking for a specif part number, please include it with your message. All Pro Adjustable Therapeutic Ankle Weight, 10 lbs.